Our Award Winning Signature Massage helps relieve pain, tension, and stress and increases general well-being. It either focuses on the main areas of pain and postural tension, or it can be a relaxing full body massage. Signature Massage modalities include, but are not limited to: Deep Tissue, Swedish, Sports, Myofascial Release, Trigger Point, Cupping, Foot Focus, Reflexologyl, Migraine Relief, Lymphatic Drainage, Pediatric, Yogassage, and Ultimate Relaxation. Every part of our body suffers from the aging process and chronic stress. For example, muscles degenerate as we age by replacing functional muscle tissue with dysfunctional fibrotic tissue. Massage slows this process down. Our massage therapists are trained to search for the underlying causes of physical stress on the body. Many times, muscles develop painful trigger points (myofascitis) because they have become weak or are being pulled on by other tight muscles. Our therapists have been trained by Randy Moyer, DC to analyze our Denver massage therapy clients for the most common postural faults. Additionally, the Moyer Total Wellness staff prescribes exercises at the conclusion of almost every massage session. Our massage staff has experience working with clients with the most common causes of physical stress: poor posture caused by sitting too much, repetitive motion injuries, acute trauma such as sports injuries or car crashes, as well as emotional stress. Physical stress is not the only kind of stress we can help with. Day to day stress is very real and often can lead to physical muscular pain as well. Massage Therapy is shown by research to inhibit the stress response. The classic example of stress is when a person has to run or fight to save their life. Imagine your family hiking in the woods and a momma moose decides to defend her newborn baby by charging at you. This is very serious. Fortunately, your body is equipped with a fantastic stress response. Your heart rate goes up, you breathe faster, your muscles tense up, your muscles receive up to 1000% more blood and resources, and you begin to burn the stored energy out of your muscles. In short, to save your life, the stress response gets your muscles ready to run or fight. To do this, your body stops delivering blood and energy to the organs not needed to immediately save your life. Your body does not take the time to worry about digestion, fertility, immunity, or detoxification if you are being charged by a moose. But, what happens when you feel stressed from life. Work, finances, and family matters often trigger the stress response. So, when you encounter day to day stress, your muscles tense up and most of your organs are shut down. Your digestive system, immune system, detoxification, basically all the systems of your body that responsible for keeping you healthy stop working! It is estimated that a 1-hr Massage Denver session provides 8 hours of relaxation. A good full body massage therapy session takes you out of your stress reaction and into your healing mode. 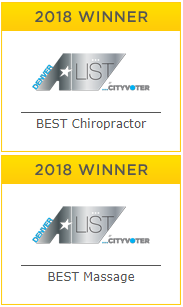 Call today to schedule a professional massage with one of our award winning massage therapists. You will be glad you did.